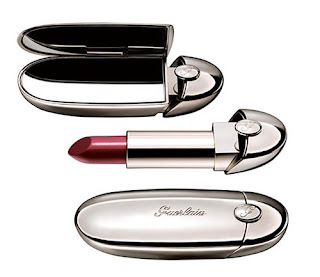 This is a high-design lipstick by Guerlain, and I just can't stop thinking about it! The chic Parisian case was specially designed by Lorenz Baumer, a talented jeweller from Paris. The lipstick is made with ruby-powder, which makes it sound more amazing. It's available in 25 shades and each shade name starts with 'G' (Gina, Gisele, Greta etc.) ) I'm still finding out if it's available here. It's definitely going to be one of my 'collectible items' as it looks too fabulous to be fiddled with too much. It's priced at $45, so ladies start saving up if you've fallen in love with it.